Cilantro is the Spanish name for the coriander leaves widely used in Mexican, Chinese, and South Asian cuisines. 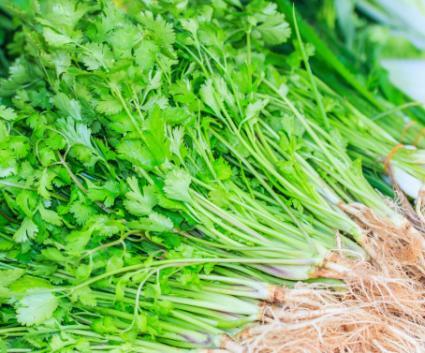 Although you can purchase cilantro at most grocers, you can also grow it yourself, even if you don't have a "green thumb." 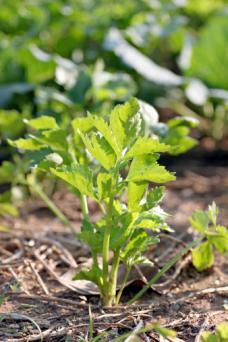 In fact, cilantro is so easy to grow that some say it grows itself! This short-lived annual Coriadrum sativum comes from a large family of aromatic culinary favorites including cumin, caraway, fennel, anise, dill, angelica, chervil and celery. Carrots and parsnips are its not-so-aromatic cousins. They get their family name Umbelliferae (also called Apiaceae) from the characteristic appearance of their flower heads called umbels. The deep green leaves, similar in shape to the leaves of Italian flat leaf parsley, only smaller, are called cilantro in the United States, coriander leaves in United Kingdom, and Chinese parsley by some. The seeds are just coriander and come whole or in powder form. It's pretty easy to grow cilantro if you live in USDA zones 3 to 10. You can either source named varieties from nurseries stocking herbs, or just buy whole seeds from the super market. They are actually dried fruits; either remaining whole and globular, in halves that contain a seed each. Gently rubbing them between the hands will split them. This is not necessary though. The time of planting does matter when you're growing them outdoors in garden beds. For zones 11 and above, pot culture is best, unless you can find a cool shady area with plenty of moisture in the soil. Coriander plants are typically planted in well prepared loamy or sandy soil enriched with farmyard manure. After tilling it in, rake the bed and make fine tilth up to a depth of one foot. You can adjust the pH to around 6 for best results. Water the bed well the day before sowing. When the top layer of soil appears nearly dry, sow the seeds six inches apart in one inch deep furrows and cover with soil. Water the bed every day; lack of moisture can reduce germination rate. Once the seeds sprout, use fine spray for watering, and keep the bed damp. The tender seedlings wilt all too easily in hot and dry conditions. They'll be grateful if you can provide temporary shade and protection from drying winds. Cilantro is rarely bothered by pests or disease, most likely due to its strong aroma, which makes it an excellent insect repellant. The plant can, however, be bothered by leaf spot and powdery mildew if there is too much moisture or poor air circulation. Keep plants in well drained soil and be sure to thin them out to promote good air circulation. The first few leaves are not divided, but subsequent ones will be. In about six weeks, the plants will have leaves four inches long. Pinch the growing tips at this time for bushier growth. It slows down this short-lived plant's irreversible journey towards flowering, seeding and death. You can start harvesting the bottom set of leaves, but that's too tedious. If you have a sizeable bed, pulling out whole plants is better. Thinning the bed this way promotes the growth of the remaining ones. You can start another bed now or every three weeks. It'll keep you in cilantro round the year, provided frost doesn't kill them. Wash the plants immediately under running water and remove any yellowing leaves. The whole plant can be cut up, root and all, or you can just stick to the leaves. If you want to get some coriander seeds as well as cilantro, leave some healthy plants to complete their life cycle. It may take about 100 days or more. When harvest time comes, don't pinch their growing tips or harvest more than one third of their leaves. You'll find the plant eventually sending out a tall shoot. This will branch out, sporting several umbels or flower heads carrying white to light pink flowers. Tiny greenish white berries soon appear, and they become harder and drier as they mature. Watch the seed heads for signs of maturity. If you notice several seeds missing, it's time to harvest the bunch. Take a large brown paper cover and coax each flower head into it and cut it off the plant. Leave them in the cover until the stems become dry. Close the bag and shake well to dislodge the seeds. Dry them further and store. You can plant some of these seeds next season and use some to cook with. 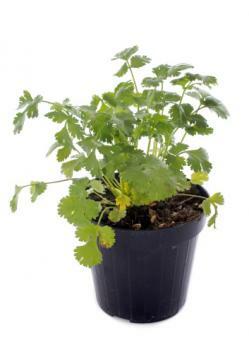 In areas where it is either too cold or too hot for coriander, you can grow it in pots with good results. Directly sow the seeds by poking one-inch holes in the soil and covering them up with more soil. Keep the soil moist at all times. Since pot culture may not give you substantial amounts of seeds, it's a good idea to grow individual plants in five-inch wide deep pots for just the herb. The seedlings may appear in a week's time and produce new leaves with fringed edges for the first two to three weeks. They need bright light, preferably direct sun for four to five hours a day. Once a few divided leaves start to appear, harvest the outer leaves whenever you need the herb, but never more than one third at a time. Pinch the growing tip too, to promote bushy growth and prevent bolting (setting seed). Partial harvesting can be repeated three to four times. You can pull out the plants at around six to eight weeks and start a new one in the same pot after changing the soil. 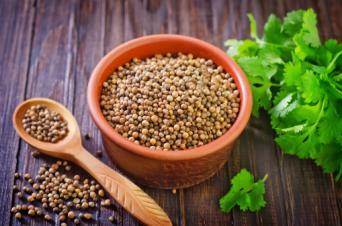 Coriander seeds are part of curry mixes, but the taste and flavor of the seeds and the leaves are worlds apart. The leaves are often described as peppery and lemony and the seeds as subtle and earthy. If someone says 'cilantro,' there's no ambiguity. But if any recipe calling for coriander asks you to chop it, it also means the plant's leaves, unless it's a Thai dish calling for the roots of the plant, which are more pungent. Lao coriander (Anethum graveolens/dill), Culantro (Eryngium foetidum) French parsley (Anthriscus cerefolium/chervil) are not true coriander, even though they belong to the same family. Coriander leaves are best used fresh and finely chopped as a garnish to salads, soups or curries. They may be incorporated into salsa, guacamole or similar condiments too. Heating takes away the edge somewhat, and cooking almost completely destroys the flavor, and even makes it bitter. Drying also kills the flavor; hence the leaves are either preserved in oil or frozen in water for long-term storage. The sweet smell and flavor of coriander seeds go well with all kinds of meat dishes where they are usually used in the powdered form. Curries are never curries without coriander them. Some recipes call for freshly ground coriander seeds or roasted and powdered coriander. Whole seeds are added to pickles and crushed ones to burgers and meat casseroles. No matter whether you love the cilantro plant for its leaves, seeds, or both, it is extremely versatile and worth planting. It adds just the right amount of zest to any meal.